Ballymena United under 14s who will debut in the National Premier League this season. This weekend sees a number of Ballymena United Academy and senior youth sides begin their National league campaigns. From under 13 onwards, all the academy sky blue sides will be competing in the Premier division this season, the highest level in youth football in Northern Ireland. The under 13’s face Lurgan away this Friday evening and the new look squad will be hoping to continue some of the good football which has been on display over the last few pre-season games. The under 14’s have to wait until next Tuesday evening for their opener at home against Limavady Youth. These boys have been NI champions and B league winners over the last couple of years, their success has been recognised with a number of boys selected for the national training group. 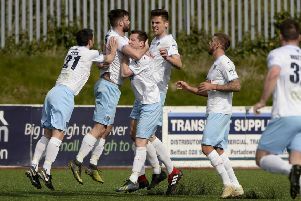 The under 15’s, under the tutorship of top Irish League striker Gary Twigg, begin their second season in the top tier as Ballymena’s only representatives. With new signings and with a new coaching team onboard will be hoping to improve again on last season’s endeavours. The under 16’s warmed up for their campaign with a pre season 3-1 victory over Coleraine on Saturday, new signing from Carniny Ronnie Marshall amongst the scorers. These boys also are away to Lurgan next Monday evening 31st August. The under 17’s kick off this Friday evening with an away trip to St Oliver Plunkett. A number of boys from this group have already made the step up to the successful senior youth team in pre season.